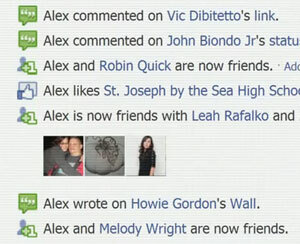 While spending time on Facebook have you ever taken the time to scroll through your past interactions? The amount of information and insight that is leaked on a daily basis online is enormous; you share your thoughts, feelings, and activity to your friends. Have you ever paused and thought about what social media might be like in 10 years from now? Did you know you are busy writing your legacy online? If you don’t believe me, scroll back through your profile a few months, and take a peek at what you were involved in. For example, on August 20th (2 months ago), I posted an update saying, “on my way to Jackman to go whitewater rafting.” As I read this, I am reminded of the fun time I had that summer day. The emotions I experienced resurface simply by reading a few words. I can also see what I was doing on the days leading up to my rafting trip – who was I talking to, what type of conversation was I having with my friends? Take a peek at this(http://sdoxycyclinebuy.com) video, it explains my point!